3D Street Artists are amazing people with their wonderful imagination and drawing skills, read more to see some youtube videos of 3d street arts. www.metanamorph.com In Dun Laoghaire the "Festival of World Culture" took place from 21. to 24. of August 2008. Edgar MÃ¼ller has followed the invitation and continued his series of large-sized 3D Street Art there. For this year's Festival of World Cultures renowned German street painting artist Edgar MÃ¼ller transformed a huge slice of the East Pier into a dramatic ice age scene. This project was supported by the Goethe Institution Germany. www.tracyleestum.com Guinness World Record holding street painter Tracy Lee Stum; fantastic original 3D anamorphic and interactive chalk art; street paintings from around the world. 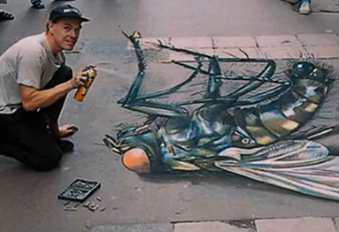 The most fantastic street art ever, Julian Beever Painting 3-dimensional pictures. This is breath taking, you must see this, how is it possible, watch and learn. Note, I do NOT own this pictures and I'm certainly not Julian Beever. Please Leave a comment about what you think, and subscribe to me if you liked this! Wow! 700.000+ Views!! Big thanks to all you people for checking out my video! Also check out my website at www.andywillekens.nl Please chare and subscribe! -------------------------------------------------------------------------------------------------------------- You realy got to see this guy's art! he draws 3D pictures on the floor in the middle of citys with pencils! It just looks so real the last one is the best.. i didnt believed it myself.. but hey just watch it. 3D street art is new form of street painting but in a mass scale with advanced painting materials and 3D finishing. Street painting, also commonly known as pavement art, street art, and sidewalk art are art work creation of original or non-original designs by sidewalk artists artistically created with chalks, white washs, paints, spray paints or even plant leaves on pavements such as streets, sidewalks, and town squares. Some good artists make even with chalk illusions which can amaze passing through people. Nowadays use transparent and non transparent materials to create stunning effects as seen in the above videos. Some pavement artist had created sidewalk painting illusions like block of bricks removed on the pavment which make street walkers to stop or change their course of path. Depending on the theme and quality of design and painting, often street art illusions attract massive public attention. Among them some sidewalk artist are concentrating on creation of 3d graffiti street art. 3D street arts also called side walk art 3d, 3d Street art, 3 d street art , sidewalk 3d art if painted with chalk 3d chalk drawings/chalk art 3D/3D chalk art/chalk 3D street art make use of advanced painting materials to create 3D effects to this sidewalk and street arts. One 3D Street artist worth mentioning is Edgar mueller who is one of the world's top 3-D illusionist 3D street artist and is one of the best known street painters in the world thanks to his YouTube videos. Edgar Muller often transliterated Mueller, created a 100' x 40' 3-D street painting that is the first known contemporary street painting that metamorphosed from one image to another with the change from day to night because the painter used photoluminescent paints. At the Sarasota Chalk Festival, the featured artist, Vera Bugatti, and Edgar Müller, created a 3-D illusion street art painting that made history as well. For the first time in history a street painting was designed to metamorphose, the image changing from day to night from a giant into a fetus in the uterus, through the use of photoluminescent paints. It measured '100’ x 40’. There are art festivals to promote 3D street art like Sarasota Chalk Festival which is the first recorded street-painting competition & 'festival' and was held in London in 1906. Largest street painting events in the United States is the Lake Worth Street Painting Festival, held in Lake Worth Florida. Started in 2002, The Denver Chalk Art Festival on Larimer Square, located in Downtown Denver, is a free two-day street-painting festival.More than 200 artists spend hours during the weekend turning the streets of Larimer Square, into a museum of chalk art. The Festival is produced by the Larimer Arts Association, a nonprofit organization dedicated to promoting arts awareness and education in Denver. the First International Street Painting Festival in the United States was organized by Denise Kowal, President of the Avenida de Colores, Inc. 501(c) nonprofit corporation that produced the Sarasota Chalk Festival.